Factor jit experimented in Finance. Earn 10% from your Savings Account! 10% !!! 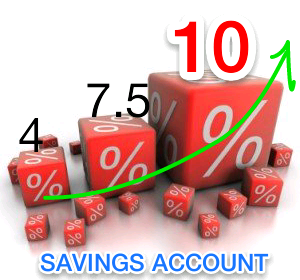 Your Savings Account can simply give 10% return! Yes! 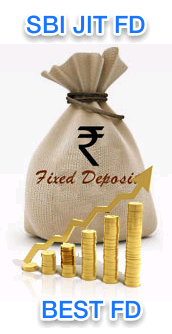 I am talking about you Savings Account not the Fixed Deposits! One Sunday morning in this January of 2014, when I was going through an old edition of Economic Times, an advertisement of a nationalised bank, reignited the Saturday’s train of thoughts. A spark came to my mind, which I felt could solve yesterday’s riddle. I asked my wife, who was busy in the kitchen, to share her calculator and pen for a while. There is an agreement with me and my wife, she be the care taker of our savings and myself of the investments. It always pinched me that the chunk of money I kept in my Savings Account ready for investment, earned just 4%, where as her savings in Fixed Deposits earned nearly 10% consistently. Now in the Saturday evening when I was going through my SBI’s internet banking login, their 7.5% interest rate on the deposit for a term of 1 week and the feature off e-Fixed Deposit put a smile on my face. When tested it, found to work perfectly as I expected. It auto renews in a week, paying back the interest to my Savings Account. I myself can make them and break them within few seconds. Now my money in wait time can return 7.5%, but much below the iconic 10% return. Back to the Sunday morning. In few moments I felt like raring to go. The “calci” and pen were in front of me! I am very thankful to my wife. She is rarely offensive to my cranky ways. I scribbled some quick combinations of I = PNR on the Economic Times, to reach a magical figure for P as I have little control over the other factors, I=Max Return, N=7 Days and R=7.5%. 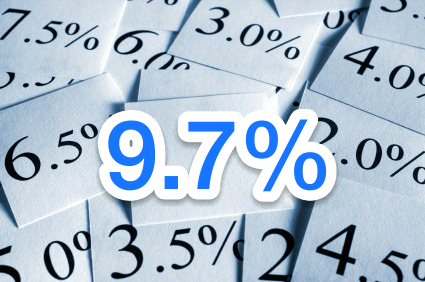 SBI has been continuously revising their interest rates for Domestic Term Deposits during the second half of 2014. On Mon 2 Dec 2014 came the latest revision. They now pay an interest of 5% pa. for a term of 1 week. 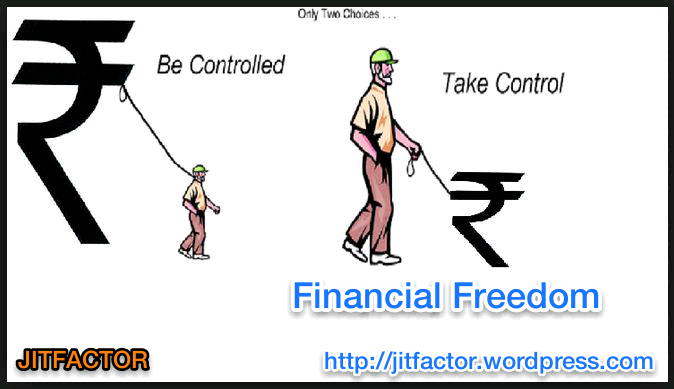 As R (Rate of Interest) has changed, the magical value which the P (Principal) hold is Rs.1565 now. Please read and apply the factor accordingly. 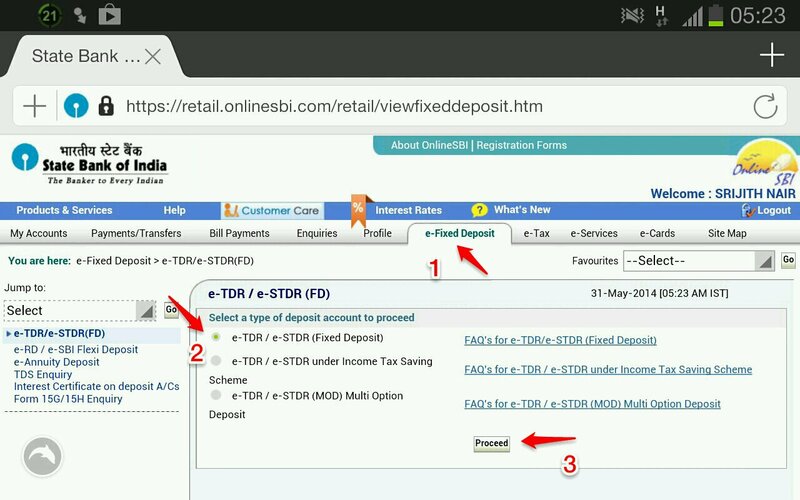 BREAK ALL YOU “SBI JIT UNIT FD” AND REMAKE THEM WITH THE NEW P (‘Amount’ in you e-Fixed Deposit form). THE LATEST INTEREST EARNED FROM “SBI JIT UNIT FD” IS 6.7 % PA. IMPORTANT NOTICE (19 July 2014):- The above notice overrides this notice. From yesterday (Fri 18 July 2014) SBI revised their interest rates. They now pay an interest of 7% pa. for a term of 1 week. Akash I am so thankful for your comment in my blog. I simply loved the timing! I can’t expect anything more from a reader. As R (Rate of Interest) has changed, the magical value which the P (Principal) hold is Rs.1120 now. Please read and apply the factor accordingly. 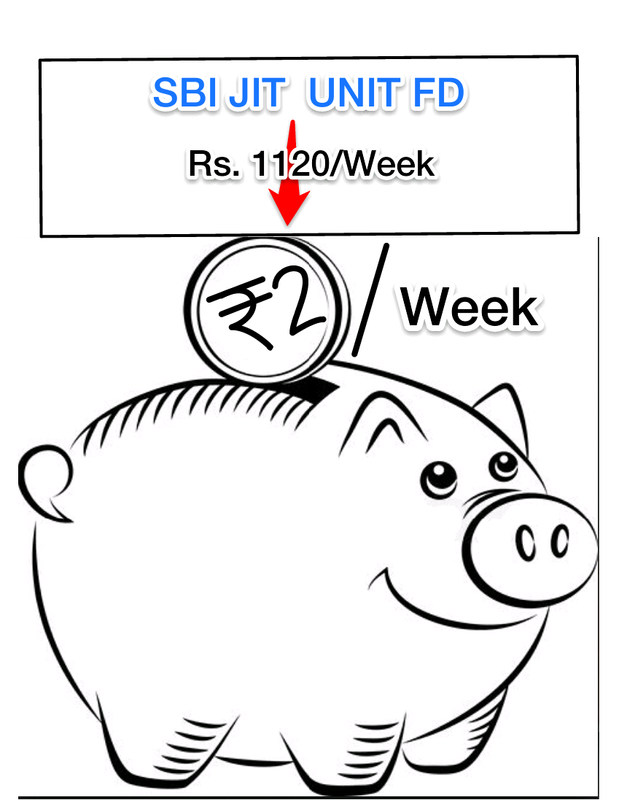 BREAK ALL YOU “SBI JIT UNIT FD” AND REMAKE THEM WITH THE NEW P (‘Amount’ in you e-Fixed Deposit form). Dear takers of “SBI JIT UNIT FD”, though the interest rate has declined, the return from the factor has not declined!…. You get Rs 105 annually from each Rs.1120 you deposit. This is way more than 9% and less than 10% pa. As this is my pet blog – the first blog, with your permission, I am taking the privilege to keep the other contents of the post unchanged. Now the magical value of P which my calculations revealed was Rs.1050. 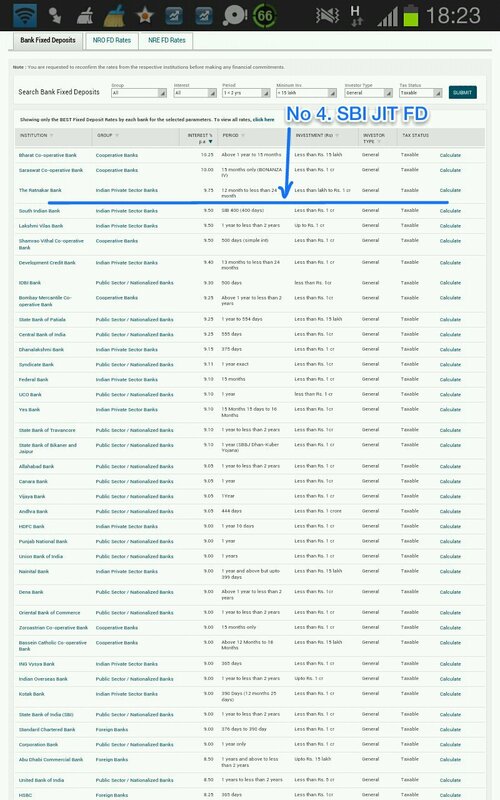 Straight away I tested it by trying to create few e-Fixed Deposit with the SBI account, with some variations of P and found the perfect value for P is Rs.1050 as expected. 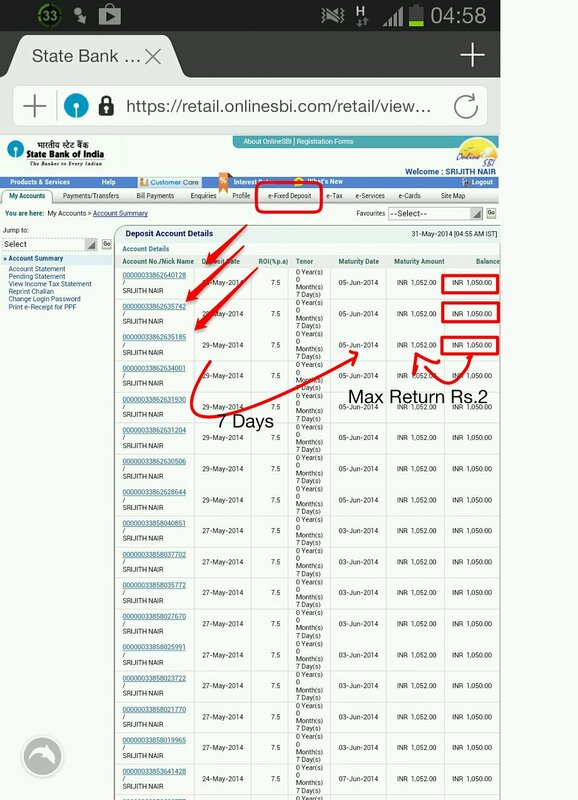 It gives an interest return of Rs.2 to my Savings Account in 7 days. Now 1 year has 52 X 7 days, I mean 52 weeks. That means A return of Rs.104 in 1 year from Rs.1050! Now for those who are dogmatic about the Re.1 which makes the return just short of Rs.105, the iconic return of 10%. Consider the interest on the Rs.52, that I got into my Savings Account in the first 6 months, at 4% per annum. I get additional Rs.1.08 for the next 6 months. So I AM JUICING RS.105 FROM EACH RS.1050 IN MY SAVINGS ACCOUNT. A CLEAR RETURN OF 10%! I called the deposit a “SBI JIT UNIT FD”. The brightness on my wife’s face, who is a Cost Account by profession, said that I had done a wonderful job. 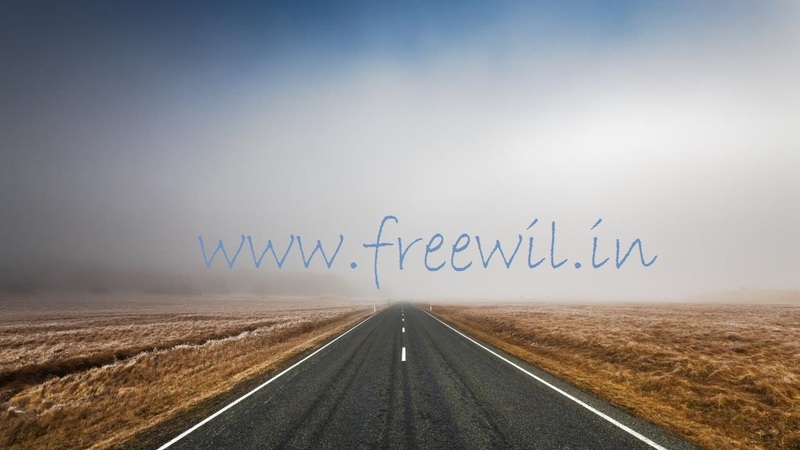 Each Unit of Rs.1050 in my account is going to deliver me 10% with the all the flexibility of Savings Account as I can make the UNITS in seconds and later break them in seconds. Now to the advocates of Sweep Account, I challenge, “SBI JIT UNIT FD” beats the Sweep Account in terms of return and function. 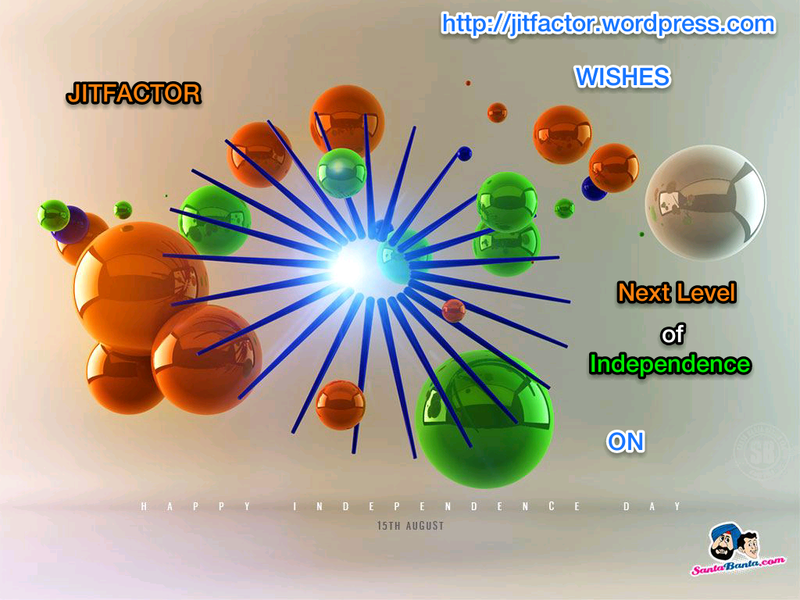 I will post a comparison of both @ “jitfactor” in a while. 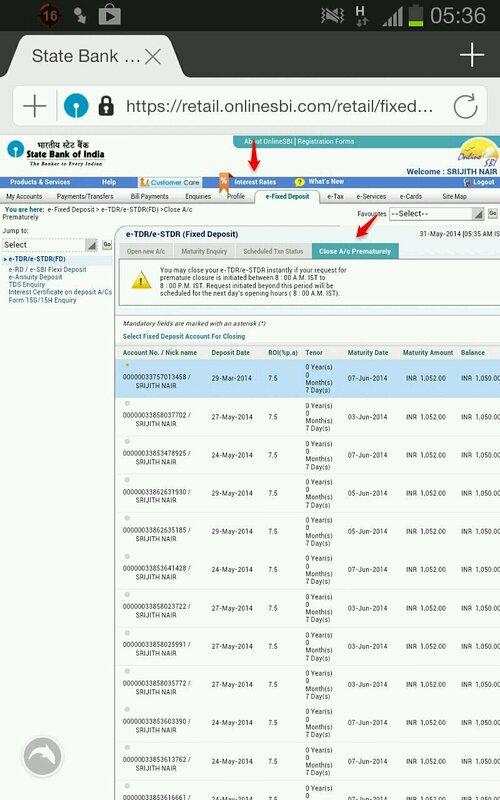 MAKING “SBI JIT UNIT FDs” Follows….. 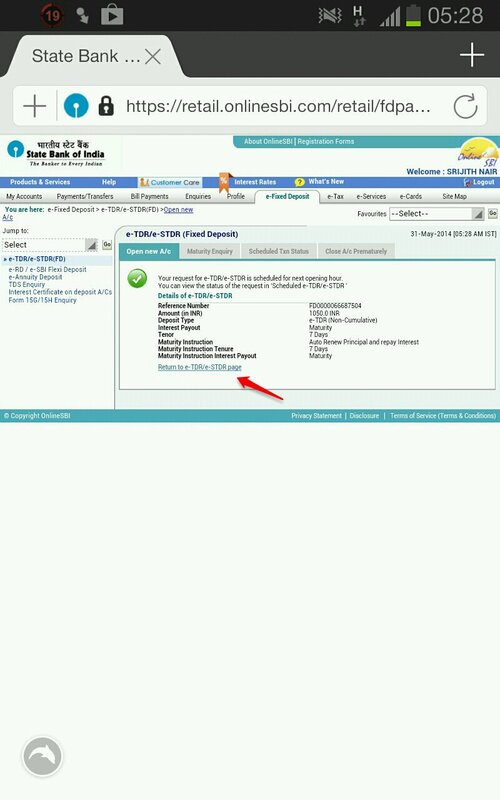 BREAKING “SBI JIT UNIT FD” Follows…..
1.Select the UNIT with a farthest maturity date. 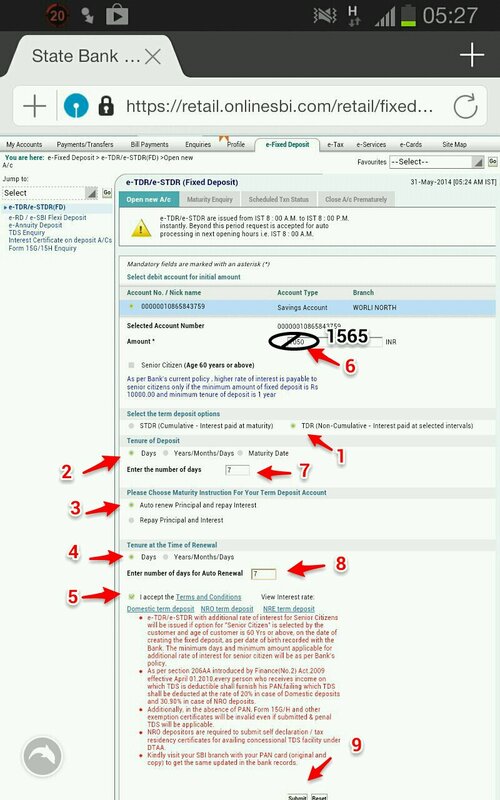 3.Enter a Remark and Confirm. 4.Enter High Security Password received on your mobile and Confirm. The money is back on your Savings Account waiting for your command. Click on the link “Return to Pre Closure Page”. Repeat steps 1 to 4 to break desired number of units. Every morning I wake hearing the rattle of 10 messages, each bringing 2 Rs. into my Account. 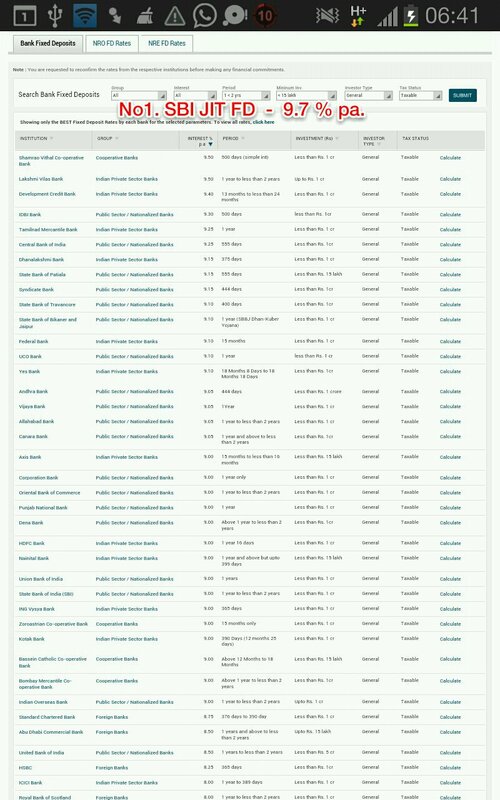 I have 70 evenly placed “SBI JIT UNIT FD” in my Account! Follow or return to the jitfactor in a while to:- Discover the “SBI JIT FIXED DEPOSIT“, which beat the best Fixed Deposit in the market in terms of returns!